2) The Very hungry Caterpillar – Fun, witty and a beautiful story how the caterpillar turns into a butterfly. 3)Elmers friends– A rather touchy one with a simple moral. 4)Twinkle Twinkle– The good ol’ rhyme in a book. Bright and beautiful stars- just what your baby will want to see before she/he goes to bed. 5) Baby’s day– This book was given to us by Bookstart as part of his newborn gift packs. Very cute pictures of babies in each page to bring a lot of smiles on your wee one’s face. Will help your baby understand and somewhat relate to the things she does in a day from the time of waking up to bedtime. 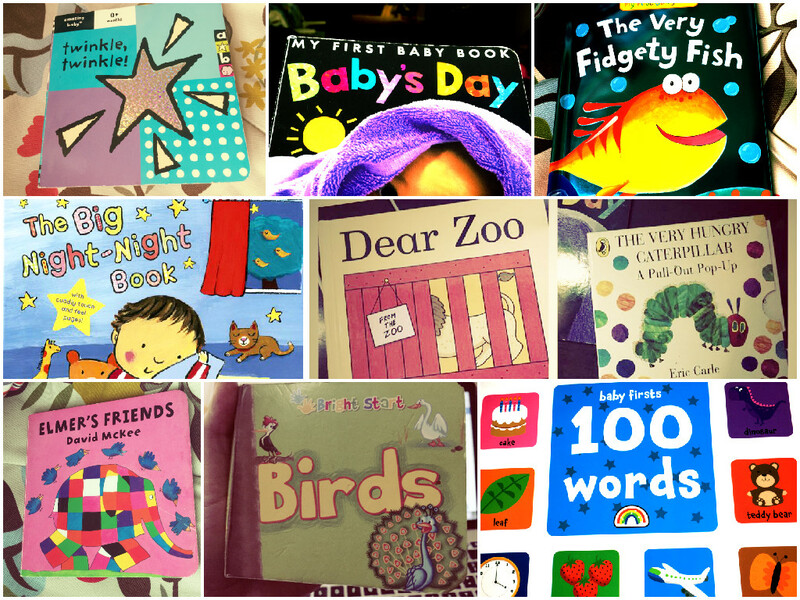 6) Baby’s First hundred words – We love it for the gorgeous pictures and nothing else. 7)The very Fidgety Fish– This is our first proper storybook. I am quite amazed myself with this one as it is such a nice book. My peanut just chats away nonstop to all the fish in the book. Besides being colourful and cute, the tale is quite the ordinary. 9) Our little gem of a book- BIRDS– It is a very simple one which my brother happened to buy off in one of those random religious book shops in Anna Nagar, Chennai while he was shopping for dad. He was so right! My boy never gets tired of reading it even after a ten times at one go. I know this so well and I actually made a tune of it which I sing ever so often these days (like when I am driving to the supermarket or loading the washing machine). Life can get a lot more interesting when you introduce your child into the world of books. I hope you enjoyed reading our picks and we would love to hear your thoughts if you get to read any of these or if you have already read them all. Just want to know what types of book u introduced to ur lil one in the early crawling stages ..
sorry for the late response. It was books like “Dear Zoo”, some lift the flap books, books with pop up features help to hold attention.